Razer mice are designed for the ultimate gaming experience, with customisable controls and great feeling models, they fit perfectly into your hand to take your gaming to the next level. With a big range on offer, it’s easy to find the right razer mouse for you. If you’re aiming for the top spec, the Ouroboros Elite is the best of the best, coming packed with features such as wireless connectivity and 11 programmable buttons for customisable control. 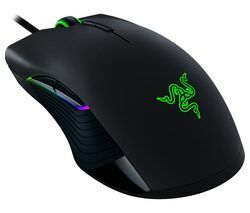 You can buy a cheap razer mouse for under £40 if you’re buying on a budget, and you’ll still benefit from features such as LED lighting and programmable buttons, giving you excellent value for money. If a razer mouse doesn’t tick your boxes, or you’re looking to spend a little less, then one of the many Mad Catz mice on the market at the moment should suit your needs. The R.A.T 3 Optical Gaming Mouse comes in under £30 and has 3 programmable buttons to give you a model which is perfect on price and has great usability. Roccat mice also offer a good range of models for a variety of budgets. 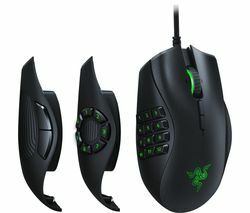 The high-spec Nyth Modular MMO Laser Gaming Mouse comes with 18 programmable buttons, up to 12,000 DPI and programmable LED lighting. It’s also compatible with Windows 10, and all for under £100 making it one of the best value top spec mice on the market. Whether you’re an experienced gamer or you’re just getting into it, our range ticks all the boxes.